You guys know how much I love being a member of the Maybelline Squad… the team are constantly sending me new releases and it’s SO exciting! 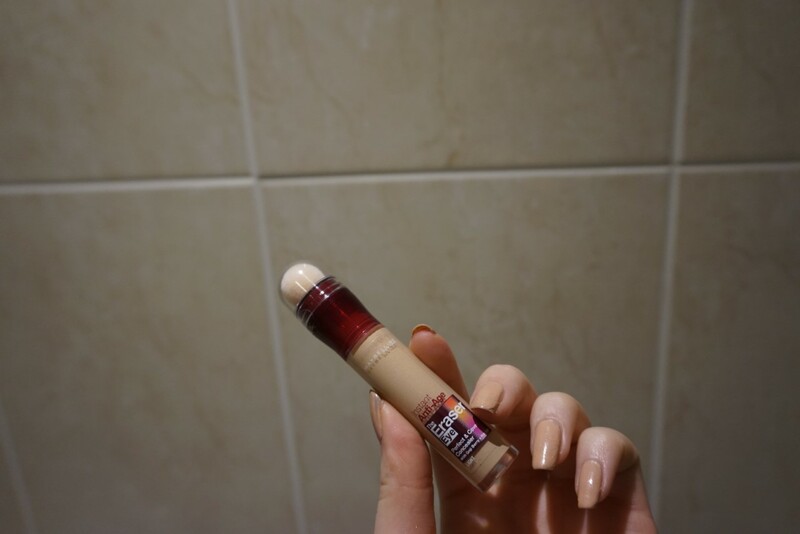 I’d heard so much positive feedback about the Maybelline Anti-Age Eraser Concealer and it’s concealing capabilities – not forgetting the incredible price-tag – so it was finally time to put it to the test. The shade ‘light’ is probably a little darker than I would usually choose (thanks to my near-translucent skin tone) and I’m used to the paleness of the Nars Radiant Concealer in Chantilly – but when topped with a coat of powder, this concealer blends nicely into my foundation and subtly reduces any discolouration of the skin (redness and purple tones). The texture is gorgeous (silky smooth) and although it takes a while to release a good amount of liquid from the spongey tip, I love the fact that the concealer doesn’t dry out due to this constant regenerating process. The sponge is great for general coverage (face and under-eyes) but less practical for one of my favourite uses of concealer… applying it with a fine brush along the lid to create a sweeping cut-crease. Having said that, if you click the tube enough times, enough formulation is released to coat a brush… it’s just a little tricky to transfer this from sponge-brush. The consistency is fairly thick, perhaps a little lighter than I would usually choose as I love HEAVY coverage but great if you’re looking for a really natural, blended finish. Overall, with the incredibly reasonable price-tag and drugstore factor considered, this product gains my seal-of-approval. Rather than completely substituting the Nars concealer from my makeup routine, I have been interchanging between the two – dependant on the type of coverage/skin finish I’m looking for on the day! Follow my blog for more posts like this! I am a huge fan of this concealer, if gives me the perfect coverage I need! Maybelline never ceases to amaze me!